Using a small offset spatula, spread a thin, even layer of marshmallow fluff around the top 1-2″ of the outside of your glass. Set glass aside. On a foil-lined baking sheet sprayed with nonstick cooking spray, toast PEEPS Chicks under a broiler, until slightly golden brown. Keep a close eye on them as they can burn rather quickly. Put 2 scoops of ice cream and ½ cup of milk in the blender. Combine briefly, then add toasted PEEPS Chicks and blend until incorporated. Add in a few drops of food coloring (use red for pink PEEPS, blue for blue PEEPS, and a mix of blue + red for purple PEEPS) and blend just until fully incorporated. Pour shake into a glass and top with some whipped cream. 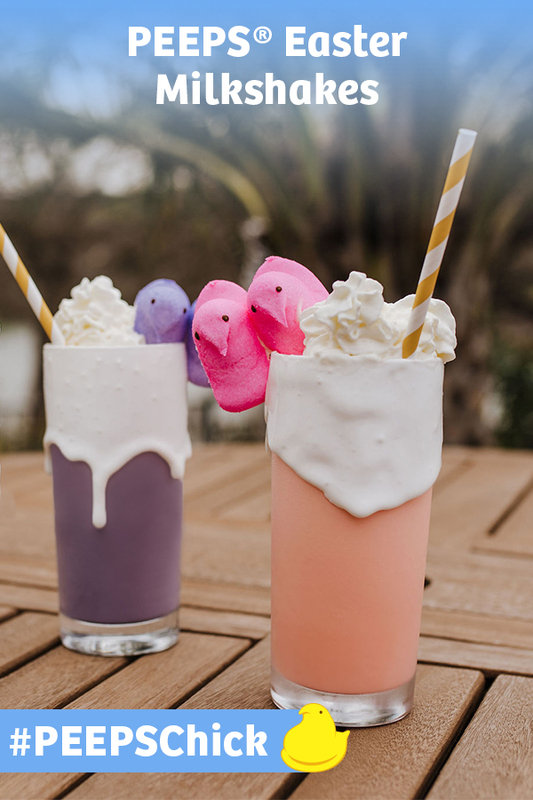 Garnish with Marshmallow PEEPS Chicks that match your color shake. Viola! Click on the PEEPS product for more details, including available sizes, nutrition info and where to buy it. Share if you loved this recipe as is, or if you added your own #peepsonality. Share your favorite PEEPS-inspired recipe with us on Facebook and it could be featured on our website. The wonderful combination of sweet colored sugar and fluffy marshmallow creates an unforgettable taste experience. PEEPS® Brand Marshmallow Candies are made by Just Born, Inc., a family-owned candy manufacturer. We make everyone's favorite candies: MIKE AND IKE®, HOT TAMALES®, TEENEE BEANEE® Gourmet Jelly Beans, GOLDENBERG'S® PEANUT CHEWS®, and of course, PEEPS® Brand Marshmallow Candies.